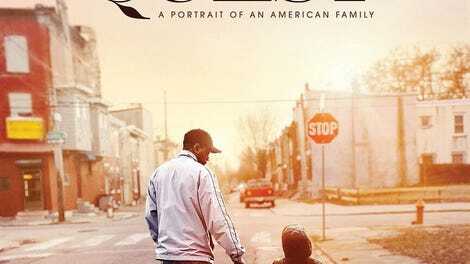 There’s no real attempt at a thesis or story arc in Quest, Jonathan Olshefski’s long-in-the-making documentary about a decade in the life of a black family in an impoverished Philadelphia neighborhood. It’s bookended, with subtle political overtones, by the 2008 and 2016 presidential elections, but there’s nothing as blunt as a “hope is replaced by fear” narrative. Obama and Trump are signifiers of time passing and perhaps the outside world changing, but nothing much changes where the Raineys—Christine’A (a.k.a. Ma Quest), Christopher (a.k.a. Quest), and their kids, along with dozens of friends and neighbors—live. There’s next to no money, but plenty of gun violence and drug abuse. But Quest doesn’t wallow or preach because Quest and Ma don’t wallow or preach, even as circumstances would desperately depress most people. Their daughter is hit by a stray bullet not far from their home, and miraculously loses only an eye and not her life. Quest’s son, Will, is diagnosed with brain cancer just as he becomes a father for the first time. And money, while never the movie’s focus, is clearly a constant worry. But there’s an inherent goodness in the couple that’s been hard-won: Quest has a checkered past that’s not fully explored, and Ma faced her own challenges, most notably being badly burned in a fire. But the two draw strength from each other, and—at least as presented here—embody a sort of ideal marriage. They argue on occasion—in one scene they gently tussle about the realization that their daughter is gay—but there’s a rare firmament to their relationship that’s the subtle heart of Quest. The couple also spend their time not only caring for their kids and celebrating their community but also giving back: Ma works at a shelter, and Quest—when he’s not delivering newspaper circulars—opens his home studio to local rappers, and he provides the beats. He clearly dreamed at one time that his little booth was a way out of poverty, but now it’s settled into something more like an outlet for his creativity and a way to socialize. Combining those moments of simple joy and realistically portraying the family’s hardships is a tricky balance. There are stretches of Quest that are tough to watch, and others you might never want to end. Olshefski pulls it off beautifully, though, because he never begs for sympathy or descends into treacle. It’s observant and human enough that it might even help correct blinkered misconceptions about life in America’s poorest neighborhoods. This is an ordinary family in unfortunately ordinary circumstances, striving to live its best life. There’s enough material in these years to make for half a dozen more focused documentaries, but none could hope to be as heartbreaking and redemptive as this panoramic longview.